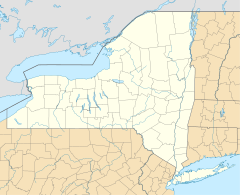 Betty and Wilbur Davis State Park is a 223-acre (0.90 km2) state park located in Otsego County, New York. The park is southeast of Cooperstown and is in the northwest corner of the Town of Westford. Betty and Wilbur Davis State Park was opened in 2001,  and fully furnished log cabins were added in 2006. The park also features picnic tables and pavilion, ponds for catch and release fishing, hiking trails, and hunting in season. During the winter, the park is available for cross-country skiing and snowshoeing. ^ a b "Betty and Wilbur Davis State Park". NYS Office of Parks, Recreation & Historic Preservation. Retrieved April 9, 2016. ^ a b "Section O: Environmental Conservation and Recreation, Table O-9". 2014 New York State Statistical Yearbook (PDF). The Nelson A. Rockefeller Institute of Government. 2014. p. 671. Archived from the original (PDF) on 2015-09-16. Retrieved April 8, 2016. ^ a b "Governor Announces Acquisition Of 164Th New York State Park". NYS Office of Parks, Recreation & Historic Preservation. August 4, 2001. Archived from the original on September 21, 2006. Retrieved October 31, 2016. ^ "State Park Annual Attendance Figures by Facility: Beginning 2003". Data.ny.gov. Retrieved June 11, 2015. ^ "State Parks Opens New Vacation Cottages Near Cooperstown". NYS Office of Parks, Recreation & Historic Preservation. June 16, 2006. Archived from the original on September 24, 2006. Retrieved October 22, 2016.